Buying a fixer upper has been a goal of ours for a long time (bucket list item for sure!). In case you didn't know, we've been together for 12 years, so dreaming of our future started when we were 17 years old (2007). When it came time to buy our first house in 2014 in Livermore, we had wanted a fixer upper. We offered on a house in a neighborhood that two of our friends lived in, and I really had my heart set it on it. It was a good price, it had the potential for an amazing kitchen, and overall would have been a good flip . We wound up having the highest offer, but lost to an all cash offer that was lower than ours. I was sad at the time, but shortly after we found the house that we would call the #poffpad. It had 7 offers and we were the highest! It had recently undergone a "home depot remodel" as we call it, which meant it was updated but done on the cheaper end and not to our personal taste. But the style was generic, so with the help of some new interior white paint and our modern furniture, we made it our own. The backyard and front yard did need help though, so that's where our attention and money went. We redid the siding on the front of the house and painted it dark blue. We put new landscaping in the front as well and a new deck and gate. The backyard got fake grass, a pergola, concrete and a veggie garden. We still had the itch for a full fixer upper though, especially once we completed all of our house projects at the Poff Pad. So when the time came for us to move back to the Central Coast, we knew THIS was our chance to get our fixer upper. We toured house after house and nothing felt right until we saw this one! So why a fixer upper? Because we are picky people with specific design taste. And unless we were moving to somewhere like Palm Springs, it would be unlikely to find a house that was stylistically our vibe. Basically no house in the Bay Area or the Central Coast would ever be our full taste (and in our budget if it was redone well) unless we did it all ourselves. 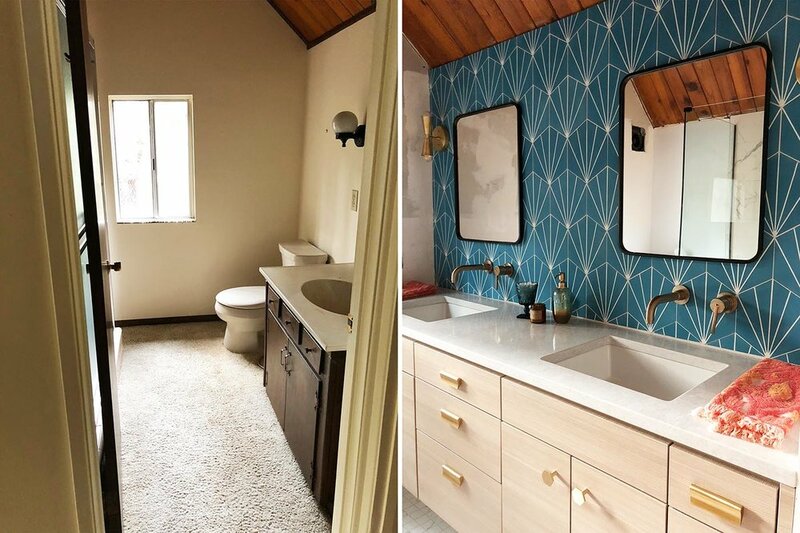 From tile choices, to countertops, to doors, to floor color, to the kitchen cabinets, we wanted to do it all and make it that desert vibes, mid century modern house we had always dreamed of. Today marks 1 year since we got the keys, so I thought it was the perfect time to share this post and share a few of our fav before/afters of our house so far! Check out our first bloopers video !